Spend more time on Facebook Messenger marketing strategy and less time on repetitive tasks when you take advantage of MobileMonkey’s automation tools! With chatbot automation in place, you can get better ROI for your efforts. Set up processes that run instantly and automatically nurture leads through your funnels and into your other business applications and workflows. See MobileMonkey automation for reaching contacts, collecting lead data, and notifying your team when hot leads are looking for you! Our free chat blaster plan has a 70-80% engagement rate — that’s a huge improvement from emails, which have an open rate of only 10-15%. 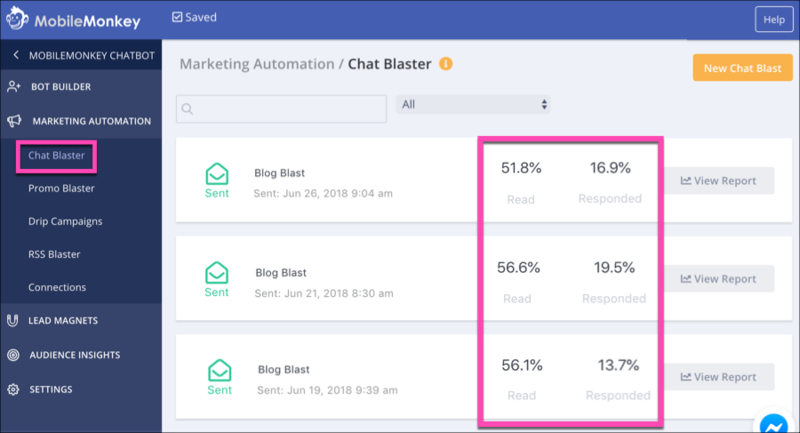 You can use this feature to chat with specific audiences, instantly blast messages, analyze chat rates and connect with growth tools. Pro users will also have access to scheduled blasts that can be based on your or the recipient’s time zone! Facebook Messenger has over 1.2 billion monthly users. 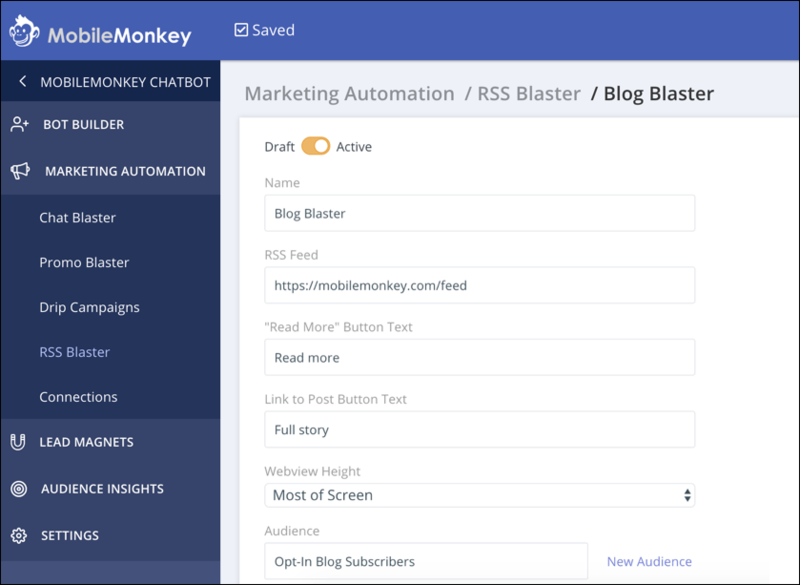 We’re making it easier to reach this audience with our RSS Blaster, sending push notifications to readers that will lead them to mobile-friendly content. The chatbot forms increases leads form completion because a conversational interface and low-friction buttons are more engaging than web forms. The user-friendly tool will also keep customers engaged on forms through guided questions, saving responses on record for future follow-up offers. Plus, Facebook already knows a lot of your customers’ basic info like phone number and email! You can populate buttons with this info to make it easy for prospects to tell you more about themselves! Alerting clients to new leads will never be easier. Only three steps are required to do so: add your widget to the chatbot workflow, put in your recipient and include a message. With that, your collected data is exported! MobileMonkey’s drip campaign automation helps you stay top of mind by nurturing leads and supports customer education and onboarding. This is done through letting your customer know how important they are — say hello and follow up with useful tips! 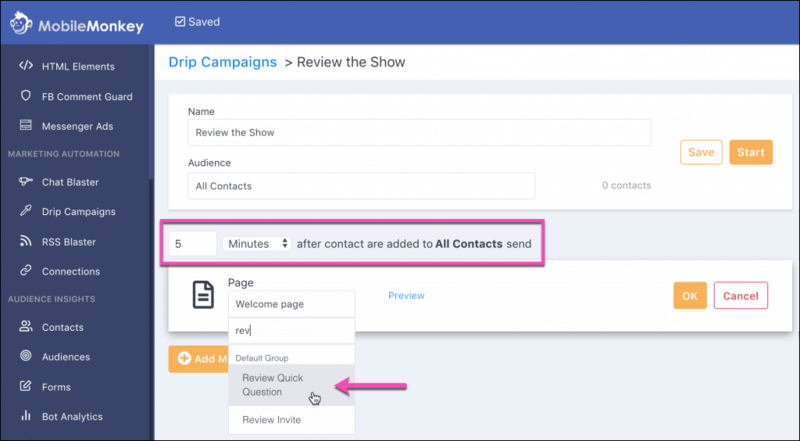 Schedule drips for any Facebook Messenger audience segment you create and on any schedule. MobileMonkey seamlessly connects with your other marketing and business systems using Zapier. The data you have in your contact database can be pushed into any of your company’s supporting systems such as CRM, team chat, cloud docs, email or webinar platforms. Leverage MobileMonkey’s advanced messaging automations for Facebook Messenger to create lead-nurturing funnels you design once and use across contacts. Scheduled blasts: Plan Messenger campaigns in advance and schedule messages for a future date and time. Blast for the recipient’s time zone: Always send blasts at optimal times for your contacts. Automatic drip campaigns: Design and schedule lead-nurturing drip campaigns to onboard and educate audiences. Integration: Connect MobileMonkey contact data to other business systems. The beauty of Facebook Messenger marketing automation is that there isn’t extra work for you. Marketing automations keep your Facebook Messenger chats running like clockwork while you focus on creating unicorn campaigns and strategies. Try it today and see just how simple it is to design and manage chatbots and leads with MobileMonkey! What Is a Facebook Messenger Bot? What Is Facebook Subscription Messaging?